How to test and treat adrenal fatigue, this 123 page ebook is based on the clinic protocol I have used for patients for over a decade, and it has rarely ever let me down. 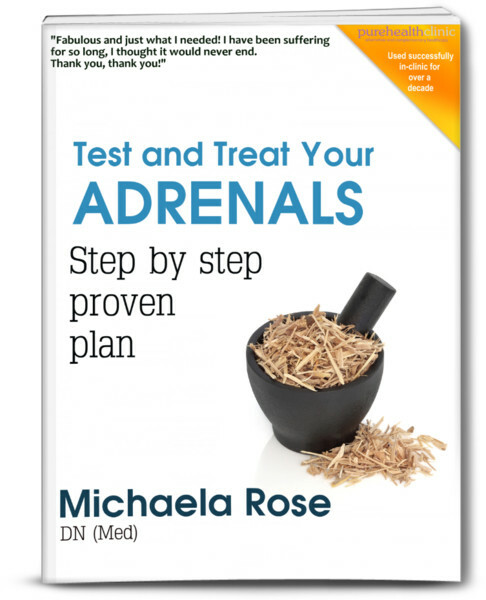 It includes much more on testing and how to interpret your results, the adrenal diet, a detailed and product-specific supplement protocol (available internationally by mail order), a full product guide appendix and how to get support. Note: if you are grain and dairy free, please get the TGF Adrenal Plan instead. Test Result Analysis: Which Stage Am I? Most people feel much better after 3-4 months on adrenal recovery in my clinical experience, so don't put up with that horrid feeling any longer. STOP PRESS: First one sold in under 3 minutes! First comment: just a quick note to say I really think this is excellent – well done. I had a passing dream of you being able to educate GPs with this document – how to make this happen...? And another... Well done Micki! For being very thorough, and explaining everything in simple terms! I think your writing style is fluent and readable, and you draw the reader through the entire subject in a logical and convincing way. I also really liked the supplement contents lists, and links to be able to source things.